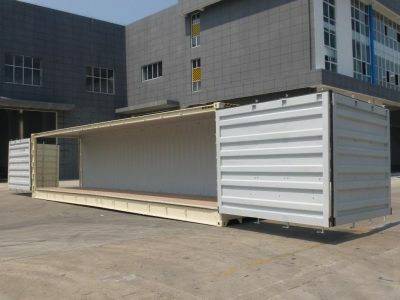 High cube open side 40 ft sea containers combine the height of high cube containers with the easy accessibility of an open side shipping container. Our high cube side containers have bi-folding side doors that draw back to a wide 12 metre opening, allowing for forklift access, and an extra 1.5 ft of height. These open side high cube sea containers are incredibly sturdy, weatherproof, vermin-proof, dry, and secure. Made with corten steel, these shipping containers are sure to last for years.